Professor of Hebrew and Oriental languages in New College, Edinburgh; born at Kirkhill, in the parish of Ellon, Aberdeenshire, Scotland, in 1831; died in EdinburghJan. 26, 1902. He was educated at the University of Aberdeen, graduating in 1849. He entered New College, Edinburgh, in 1852, to study for the ministry, and was licensed in 1857. 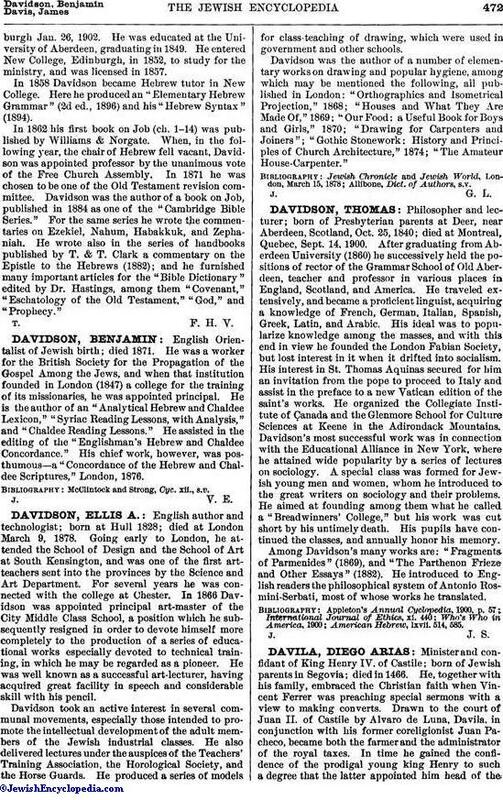 In 1858 Davidson became Hebrew tutor in New College. 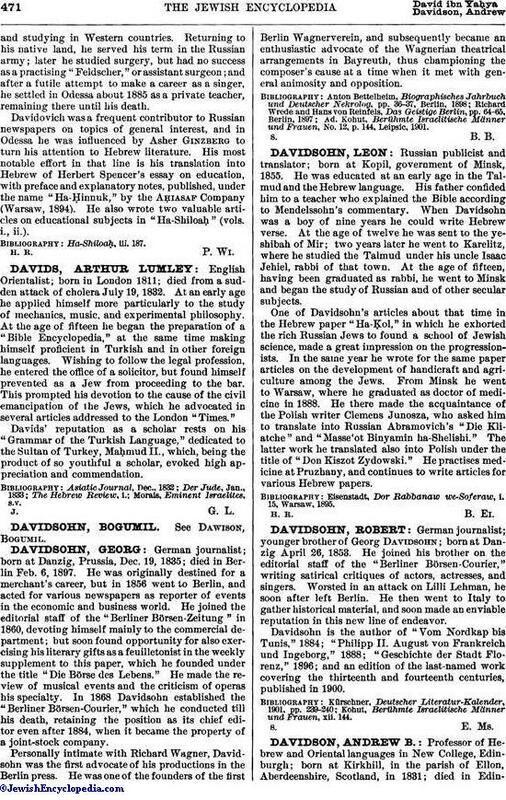 Here he produced an "Elementary Hebrew Grammar" (2d ed., 1896) and his "Hebrew Syntax" (1894). In 1862 his first book on Job (ch. 1-14) was published by Williams & Norgate. When, in the following year, the chair of Hebrew fell vacant, Davidson was appointed professor by the unanimous vote of the Free Church Assembly. In 1871 he was chosen to be one of the Old Testament revision committee. Davidson was the author of a book on Job, published in 1884 as one of the "Cambridge Bible Series." For the same series he wrote the commentaries on Ezekiel, Nahum, Habakkuk, and Zephaniah. He wrote also in the series of handbooks published by T. & T. Clark a commentary on the Epistle to the Hebrews (1882); and he furnished many important articles for the "Bible Dictionary" edited by Dr. Hastings, among them "Covenant," "Eschatology of the Old Testament," "God," and "Prophecy."